James Fraleigh is a copyeditor’s copyeditor. 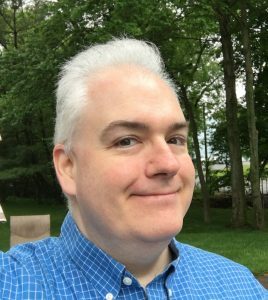 After a day of working on documents as a contractor, he’s happy to spend time reading books about editing, talking to other editors about the nuances and best practices of the job, and actively participating in online and real-world editorial meet-ups. And you thought you were dedicated to your career. 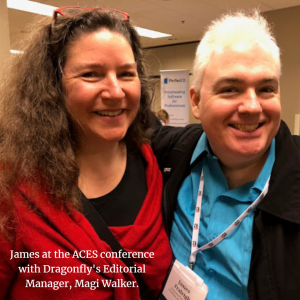 Since then, James has worked mostly on medical copy and governmental policy documents for Dragonfly, which sometimes touch on health or pharmaceutical topics. “The broad range of topics within the medical space keeps things very fresh,” he said, and that diversity is one of the things he likes best about Dragonfly. After graduation, he first worked as a production editor on psychology and social science journals at Lawrence Erlbaum, which was itself a learning experience. “It exposed me to a huge number of different job functions,” James said. “We took them from manuscript to printer. There was a lot of editor and author contact, and I learned proofreading and copyediting for the first time.” He also mastered desktop publishing, as the company had recently begun typesetting its own material. Most important, the position gave him his first taste of freelancing when he joined the department’s copyeditor pool. He spent seven years at Erlbaum, but managing a work group pulled him away from the production tasks he loved. So he left for Aspen Publishers, the legal, tax, and accounting branch of Wolters Kluwer in New York. “I was initially an editor, but the production department made me an offer, so I switched and began laying out their newsletters and journals,” he said. The tradeoff for this move away from editorial work was the chance to experience lively Midtown and Chelsea—and to catch up on reading during his commute. While transitioning to full-time contracting, James found professional associations a vital source of advice, camaraderie—and work. Joining the Editorial Freelancers Association (EFA) provided an early lifeline: Their members-only job list helped him pick up an anchor client that provided years of work.“That lasted long enough for me to begin contacting academic publishers to do the sort of work that drew on the style guide knowledge and experience with academic writing that I had built up at my first full-time job,” he said. Thanks to a strong constitution and a lucky streak of easy topics like “Women in Science Fiction” (Note: Your definition of “easy” may vary), an invitation to fly out to L.A. soon arrived. “I have taken no SAT or gone on any job interview that inspired the raw, naked terror of having to be coherent while buzzing in and answering questions for a studio audience,” he said. But he won the first day, and even managed to entertain host Alex Trebek with a spot-on Homer Simpson impersonation. James had the lead again the second day heading into Final Jeopardy. The category was “The Bible.” The product of a Catholic high school and a Jesuit university thought he might have a decent chance and bet it all. The question, which none of the contestants answered correctly, was, “The name of this two-part book of the Old Testament means ‘story of the days’ in Greek.” The answer—which James described as one of those books they always just skipped over in school—was 1 and 2 Chronicles. Despite that loss, he left with his first-day winnings of $12,300 and a consolation gas grill. But he also went home with an appreciation for the knowledge that editing could provide. He credits the eclectic reading inherent in copyediting and proofreading for “building the perfect amount of brain lint” to pull random facts from when facing down Trebek. This post was written by Kathryn Flynn, a senior editor at Dragonfly.